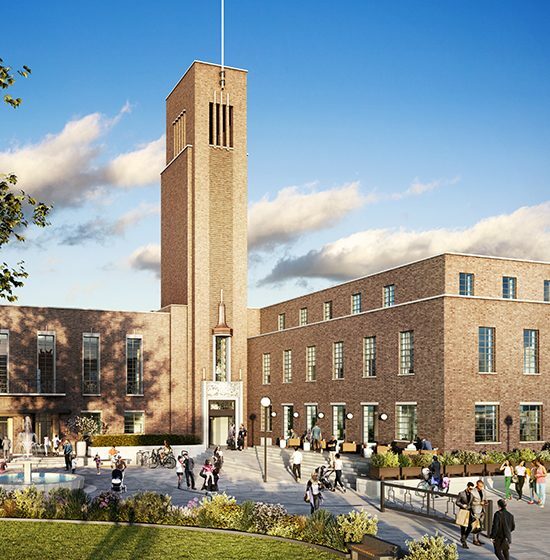 The multi-million pound renovation of Hornsey Town Hall and square – including a new arts and community centre and careful restoration of the historic Grade II* listed building – has been guaranteed. FEC (Far East Consortium International Ltd) are working alongside developer CoPlan Estates, to develop detailed designs for the Town Hall, and will appoint a specialist arts centre operator to ensure the building remains a vibrant creative hub. The agreement between the council and FEC guarantees continued public access to, and use of, many parts of the building including historically significant spaces such as the assembly hall, foyer, council chamber, supper room and committee rooms. FEC will take forward the ongoing discussion with local groups about community provision and have committed to setting up a steering group, including representatives from community organisations, once the building has re-opened. Restoration is expected to start in early 2018 and follows a decade of joint working between Haringey Council and the residents’-led Hornsey Town Hall Creative Trust (HTHCT) to secure use of the building and square, and revitalise this part of Haringey. Cllr Alan Strickland, Haringey Council’s Cabinet Member for Housing, Regeneration and Planning, said: “The significance of this agreement can’t be understated – it guarantees Hornsey Town Hall for future generations to enjoy, with millions of pounds of investment and complete renovation of one of north London’s best-loved landmarks. John Connolly, Head of Development at FEC, said: “We’re really pleased to have signed an agreement with Haringey Council to deliver the complete refurbishment of this iconic Grade II* listed building. “Our ambitious vision is for a restored Town Hall complete with a new arts centre, improved public square and a new cafe/restaurant to offer residents new community space. Hornsey Town Hall Creative Trust said: “The sensitive restoration and refurbishment of this much-loved, iconic and nationally significant architectural gem – while ensuring as much public access and use as possible – has been the raison d’être of the HTHCT throughout its 10-year existence.